As student journalists, we strive to come up with article ideas that open peoples’ minds and better the school community. Just kidding. We actually just want an idea that’s fun and doesn’t require a lot of work. That’s exactly why when instructor Ken Strobel threw out the idea of going in search of a coyote, we jumped at the opportunity. Since we’ve joined this class, we’ve written almost every article together, so it only made sense that we tackle this adventure as a team. Going into this, we honestly thought it was going to be our easiest one yet. All we had to do was go sit in the woods for an hour, see a coyote, take a picture, then write about it. Simple. Sure, Strobel told us it would be close to impossible, but he doubts us a lot, and we always prove him wrong. Why would this time be any different? He was probably just overreacting. In order to pull this off, we knew we were going to need help from the experts. First, we called the DeGraaf Nature Center, a nature preserve with interactive activities and educational services. According to Director Rob Venner, this was going to be much more difficult than we expected. “Your best chance to see them is on Lake Mac in the winter. When the lake freezes over, the coyotes will run out to catch food caught in the ice,” Venner said. Unfortunately, we didn’t want to wait until the winter; we wanted to see a coyote immediately. We also learned from Venner that while coyotes are omnivores, they mostly eat rodents and occasionally small pets. We discussed using Maddy’s dog as bait, but she wasn’t on board. Next, we called the Outdoor Discovery Center where we got in contact with Vice President of programming Jamie Krupka. He was more confident in our mission and said coyotes can be seen all over Holland. “You may even see one on the West Ottawa campus,” Krupka said. He suggested we look in open fields where we may find them looking for food. He also told us we would not have to worry about the coyotes attacking us at any point, as they are harmless to humans, that is unless they have rabies. Then run. While the advice made sense, we decided to stick to our original thought because that’s just how we do things. We found a comfy spot in Maddy’s backyard. She had seen them on a trail camera in her woods in previous years, so we decided to start there. Piece of cake. We knew coyotes were afraid of people, so we were going to have to be as secretive as possible. We went out ahead of time and prepared a fort made of sticks. We even raked out the area so we wouldn’t make any noise, but the rustling of Oreo packages and the constant giggling may have given us away. We made a pact to stay outside from 10:45 to 11:45, and the only way we could go in early was if we saw a coyote. If we’re being honest, despite everyone telling us we were bound to fail, we were feeling pretty confident. How hard could this really be? At first, we were on track to have the perfect coyote stake out: we had the perfect hideout, bate for the coyotes (turkey lunch meat), and an unbreakable silence. We looked up at the stars and realized how truly beautiful the area was. After that minute was up, the chatter instantly began. The hour flew by much faster than we expected. We talked, ate Oreos, and every once in awhile heard rustling leaves. The one thing that we didn’t do: see a coyote. Our spirits were low. We really banked everything, including our grade, on this one trip. A few days later, though, we saw one. Kind of. The trail cam from Maddy’s backyard had caught one on camera. With replenished spirits we were ready to go out again, but we had a different problem. Winter was coming. As dedicated as we were, we usually stick to the easy route in life, so snowy nights under the stars did not sound fun. It rained so we went back to bed. We decided this would be our last attempt to see the coyote. It had been taunting us for days walking back and forth in front of our trail cam. By now we had three pictures of it. The coyote was just walking by the camera waiting to be seen in two of the pictures. The last picture, though, was a message for us; it was looking directly into the camera with its big, white teeth on display, warning us to stay away. Our past attempts were far from successful, so this time we were prepared to do anything to see the coyote. After talking to Instructor Dan Dennis, we made a new plan. Instead of going out at night, we were going to try going out in the morning. “If you really want to be successful, you’ll need a dying rabbit call and a lot of patience,” Dennis said. It would be dangerous, cold, and endless. Okay, maybe he told us the coyotes would be scared of us and that we would definitely be okay, but when we went out there we could just feel it was going to be man vs. wild. The wind roared through the trees as the wildlife surrounded us from every side. Some might say it was just a backyard, but we knew better. This was a battle ground; we were going to walk away with the win. We lost. Again. Not only did we not see the coyote, but when we looked at the trail cam the following day, we discovered our nemesis had walked through just hours before. That’s right, while we were sitting on the couch planning our early morning trip, the coyote was only feet away tormenting us in front of the camera. At this point, we were starting lose our minds. The only thing that could make this worse was Strobel telling us this would in fact not be our last trip and we would not be stopping until we saw one. You have to love supportive teachers. In the following weeks we talked to many hunters. “The only time I’ve seen them was while hunting. The best advice I could give you is go in the woods with some kind of bait and wait,” hunter Mason Schuiling said. While they all gave slightly different answers as to how we should find the coyote, they all ended with the same conclusion: our mission was a game of chance. By this point, we had spent a ridiculous amount of time researching. We were obsessed. We had to push on. We came up with a plan for our next trip. This time we had an advantage: nature was on our side. The snow had fallen. We became detectives and set out to trace pawprints back to their lair: the den. We planned to go out into the middle of the day and follow any animal tracks in the snow until we found where they started. It was time for professional help. No more messing around. We were going to see one today. We walked through the door of Degraaf Nature Center. Maggie was frozen in disbelief. Maddy quickly opened her phone to snap the picture. After months of heartache, we locked eyes with the beasts. We slowly inched forward, closer to the two coyotes we had come face to face with. We succeeded. We looked around and noticed other visitors were staring at us. 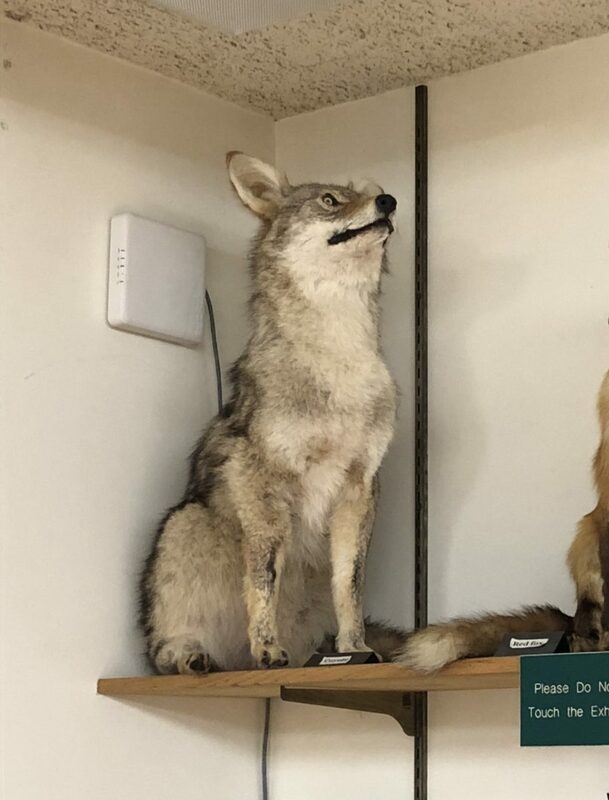 Maybe they thought it was strange to be so excited over a stuffed coyote, but how could we not be when we had been working for four months for this one moment. To even come close to seeing one, every conversation you have must be focused on coyotes. You must research nonstop. It takes determination and heart. That’s what we did. That’s how we became The Coyote Hunters.